Securely holds Raceline Flex Fence® coated wire in place on your line and corner posts, while still letting it slide through like a belt loop. They can also terminate your fencing at your end posts. Sold in increments of 1 lb. Securely holds Raceline Flex Fence® coated wire in place on your line and corner posts, while still letting it slide through like a belt loop. They can also be used to terminate your coated wire at your end posts. 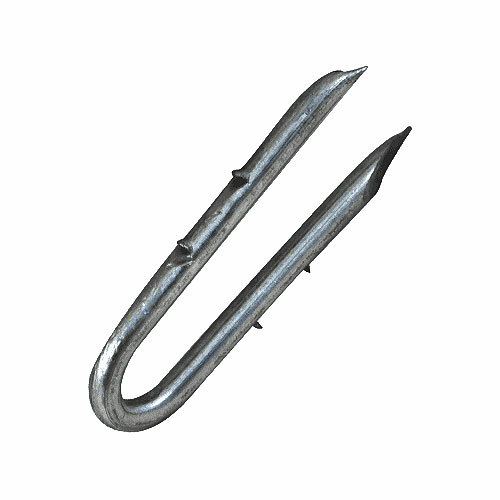 The two barbs on each side of the staple are not what you will find at your local hardware store. They grasp right into the post and make sure your rails are not going anywhere! Installation: Installs quickly and effortless with the barbed staple starter, which can be purchased separately. *Note: Leave about 1/4" gap between staple and fence rail for rail movement. - "You are the only ones to have these staples. Exactly what i need. Thank you." Includes: There are about 50 staples per pound.